For more than a century, the biosphere has been described in terms of global ecosystem units called biomes, which are vegetation types like tropical rainforests and grasslands that are identified in relation to global climate patterns. Considering that human populations and their use of land have fundamentally altered global patterns of ecosystem form, process, and biodiversity, anthropogenic biomes provide a framework for integrating human systems with the biosphere in the Anthropocene. Humans have been altering ecosystems since we have evolved. Evidence suggests that our ancestors were burning land to clear it at one million years ago. 600,000 years ago, humans were using spears to kill horses and other large animals in Great Britain and China. For the past tens of thousands of years, humans have greatly changed the plant and animal life around the globe, from what type of wildlife and plant life dominated to what type of ecosystems dominate. Examples include Native Americans; they altered the forest, burnt land to clear it, settled in cities, disrupting forests and other ecosystems, and built monuments that required moving large amounts of earth, such as the Cahokia Monuments. More examples are the civilizations of the ancient world; they mined large amounts of material, made roads, and especially for the Romans, when mining lead, released large amounts of Mercury and lead into the air. They also moved large numbers of animals for entertainment, disrupting wildlife patterns. Humans have been altering ecosystems since before agriculture first developed, and as the human population has grown and become more technologically advanced over time, the land use for agricultural purposes has increased significantly. The anthropogenic biome in the 1700s, before the industrial revolution, was made up of mostly wild, untouched land, with no human settlement disturbing the natural state. In this time period, most of the Earth's ice-free land consisted of wildlands and natural anthromes, and it wasn't until after the industrial revolution in the 19th century that land use for agriculture and human settlements started to increase. With technology advancing and manufacturing processes becoming more efficient, the human population was beginning to thrive, and was subsequently requiring and using more natural resources. By the year 2000, over half of the Earth's ice free land was transformed into rangelands, croplands, villages and dense settlements, which left less than half of the Earth's land untouched. Anthropogenic changes between 1700 and 1800 were far smaller than those of the following centuries, and as such the rate of change has increased over time. As a result, the 20th century had the fastest rate of anthropogenic ecosystem transformation of the past 300 years. As the human population steadily increased in numbers throughout history, the use of natural resources and land began to increase, and the distribution of land used for various agricultural and settlement purposes began to change. The use of land around the world was transformed from its natural state to land used for agriculture, settlements and pastures to sustain the population and its growing needs. The distribution of land among anthromes underwent a shift away from natural anthromes and wildlands towards human-altered anthromes we are familiar with today. Now, the most populated anthromes (dense settlements and villages) account for only a small fraction of the global ice-free land. From the year 1700-2000, lands used for agriculture and urban settlements increased significantly, however the area occupied by rangelands increased even more rapidly, so that it became the dominant anthrome in the 20th century. As a result, the biggest global land-use change as a result of the industrial revolution, was the expansion of pastures. Following the industrial revolution, the human population experienced a rapid increase. The human population density in certain anthromes began to change, shifting away from rural environments to urban settlements, where the population density was much higher. These changes in population density between areas shifted global patterns of anthrome emergence, and also had wide-spread effects on various ecosystems. Half of the Earth's population now lives in cities, and most people reside in urban anthromes, with some populations dwelling in smaller cities and towns. Currently, human populations are expected to grow until at least midcentury, and the transformation of the Earth's anthromes are expected to follow this growth. The present state of the terrestrial biosphere is predominantly anthropogenic. More than half of the terrestrial biosphere remains unused directly for agriculture or urban settlements, and of these unused lands still remaining, less than half are wildlands. Most of Earth's unused lands are now within the agricultural and settled landscapes of semi-natural, rangeland, cropland and village anthromes. Anthromes include dense settlements (urban and mixed settlements), villages, croplands, rangelands and semi-natural lands and have been mapped globally using two different classification systems, viewable on Google Maps and Google Earth. There are currently 18 anthropogenic biomes, the most prominent of which are listed below. Dense Settlements are the second most densely populated regions in the world. They are defined as areas with a high population density, though the density can be variable. The Population density, however, never falls below 100 persons/km, even in the non-urban parts of the dense settlements, and it has been suggested that these areas consist of both the edges of major cities in underdeveloped nations, and the long standing small towns throughout western Europe and Asia. Most often we think of dense settlements as cities, but dense settlements can also be suburbs, towns and rural settlements with high but fragmented populations. Croplands are another major anthrome throughout the world. Croplands include most of the cultivated lands of the world, and also about a quarter of global tree cover. Croplands which are locally irrigated have the highest human population density, likely due to the fact that it provides crops with a constant supply on water. This makes harvest time and crop survival more predictable. Croplands that are sustained mainly from the local rainfall are the most extensive of the populated anthromes, with annual precipitation near 1000 mm in certain areas of the globe. In these areas, there is sufficient water supplied by the climate to support all aspects of life without hardly any irrigation. However, in dryer areas, this method of agriculture would not be as productive. Rangelands are a very broad anthropogenic biome group that has been described according to three levels of population density: residential, populated and remote. The Residential rangeland anthrome has two key features: its population density is never below 10 persons per square kilometre, and a substantial portion of its area is used for pasture. Pastures in rangelands are the most dominant land cover. Bare earth is significant in this anthrome, covering nearly one third of the land for every one square kilometer. Rangeland anthromes are less altered than croplands, but their alteration tends to increase with population. Domesticated grazing livestock are typically adapted to grasslands and savannas, so the alteration of these biomes tends to be less noticeable. Forested anthromes are dominated by tree cover, and they have high precipitation and minimal human populations, where the population density is usually less than 3 persons/km². Most populated forests act as carbon sinks because of the lack of human activity. Without harmful emissions being released in the forests due to human activity, the vegetation is able to utilize carbon dioxide in the atmosphere, and act as a sink. Remote forests are a little different than populated forests because the majority of the vegetation in these forests have been clear-cut for human consumption. Forests are generally cleared to sustain substantial populations of domestic livestock, and to utilize the lumber. Very few biologists have studied the evolutionary processes at work in indoor environments. Estimates of the extent of residential and commercial buildings range between 1.3% and 6% of global ice-free land area. This area is just as extensive as other small biomes such as flooded grass-lands and tropical coniferous forests. The indoor biome is rapidly expanding, while forest anthromes are shrinking. The indoor biome of Manhattan is almost three times as large, in terms of its floor space, as is the geographical area of the island itself, due to the buildings rising up instead of spreading out. Thousands of species live in the indoor biome, many of them preferentially or even obligatorily. The only action that humans take to alter the evolution of the indoor biome is with cleaning practices. The field of indoor biomes will continue to change as long as our culture will change. Managed aquatic biomes or aquatic anthromes have rarely been studied as such. They range from fish ponds, marine shrimp and bentic farming sites to large tracts of land such as parts of the Guadalquivir Marshes in Andalusia, Spain. Humans have fundamentally altered global patterns of biodiversity and ecosystem processes. It is no longer possible to explain or predict ecological patterns or processes across the Earth without considering the human role. Human societies began transforming terrestrial ecology more than 50 000 years ago, and evolutionary evidence has been presented demonstrating that the ultimate causes of human transformation of the biosphere are social and cultural, not biological, chemical, or physical. Anthropogenic biomes offer a new way forward by acknowledging human influence on global ecosystems and moving us toward models and investigations of the terrestrial biosphere that integrate human and ecological systems. Over the past century, anthrome extent and land use intensity increased rapidly together with growing human populations, leaving wildlands without human population or land use in less than one quarter of the terrestrial biosphere. This massive transformation of Earth's ecosystems for human use has occurred with enhanced rates of species extinctions. Humans are directly causing species extinctions, especially of megafauna, by reducing, fragmenting and transforming native habitats and by overexploiting individual species. Current rates of extinctions vary greatly by taxa, with mammals, reptiles and amphibians especially threatened; however there is growing evidence that viable populations of many, if not most native taxa, especially plants, may be sustainable within anthromes. With the exception of especially vulnerable taxa, the majority of native species may be capable of maintaining viable populations in anthromes. Anthromes present an alternative view of the terrestrial biosphere by characterizing the diversity of global ecological land cover patterns created and sustained by human population densities and land use while also incorporating their relationships with biotic communities. Biomes and ecoregions are limited in that they reduce human influences, and an increasing number of conservation biologists have argued that biodiversity conservation must be extended to habitats directly shaped by humans. Within anthromes, including densely populated anthromes, humans rarely use all available land. As a result, anthromes are generally mosaics of heavily used lands and less intensively used lands. Protected areas and biodiversity hotspots are not distributed equally across anthromes. Less populated anthromes contain a greater proportion of protected areas. While 23.4% of remote woodland anthrome is protected, only 2.3% of irrigated village anthrome is protected. There is increasing evidence that suggests that biodiversity conservation can be effective in both densely and sparsely settled anthromes. Land sharing and land sparing are increasingly seen as conservation strategies. ^ a b c Ellis, E. C.; Ramankutty, N. (2008). 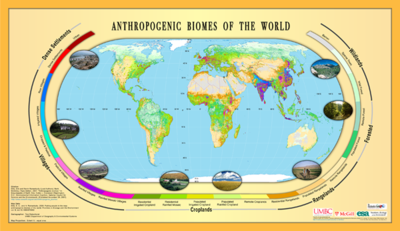 "Putting people in the map: anthropogenic biomes of the world". Frontiers in Ecology and the Environment. 6 (8): 439–447. doi:10.1890/070062. ^ Chapin III, F. Stuart; Matson, Pamela A; Vitousek, Peter M (2012). Principles of Terrestrial Ecosystem Ecology (Second ed.). Springer. ISBN 978-1-4419-9504-9. ^ National Geographic Society (2014). National Geographic Atlas of the World (10th ed.). National Geographic. ISBN 978-1-4262-1354-0. ^ a b Botkin, Daniel B. (2017). "Chapter 10: People Have Changed the Environment Only Since the Industrial/Scientific Age.". 25 Myths That Are Destroying the Environment: What Many Environmentalists Believe and Why They Are Wrong. Taylor Trade Publishing. pp. 95–102. ^ a b c d e f g Ellis, E. C. (2011). Anthropogenic transformation of the terrestrial biosphere.Philosophical Transactions of the Royal Society of London A: Mathematical, Physical and Engineering Sciences, 369(1938), 1010-1035. ^ a b c d e f g h Ellis, E. C., Klein Goldewijk, K., Siebert, S., Lightman, D., & Ramankutty, N. (2010). Anthropogenic transformation of the biomes, 1700 to 2000. Global Ecology and Biogeography, 19(5), 589-606. ^ a b c d e Alessa, L., & Chapin, F. S. (2008). Anthropogenic biomes: a key contribution to earth-system science. Trends in Ecology & Evolution, 23(10), 529-531. ^ a b c d e Ellis, E. C. (2013). Sustaining biodiversity and people in the world's anthropogenic biomes. Current Opinion in Environmental Sustainability, 5(3), 368-372. ^ Ecosystem approach to Aquaculture management and biodiversity conservation in a Mediterranean coastal wetland: case study of Doniana marshes (Andalucia, Spain), United Nations Environmental Program / Mediterranean Action Plan, Tunis 2012. ^ a b c Ellis, E. C. (2015). Ecology in an Anthropogenic Biosphere. Ecological Monographs. ^ a b c Martin, L. J., Quinn, J. E., Ellis, E. C., Shaw, M. R., Dorning, M. A., Hallett, L. M., ... & Michel, N. L. (2014). Conservation opportunities across the world's anthromes. Diversity and distributions, 20(7), 745-755.